Planning made Simple- Weddings made Gorgeous! 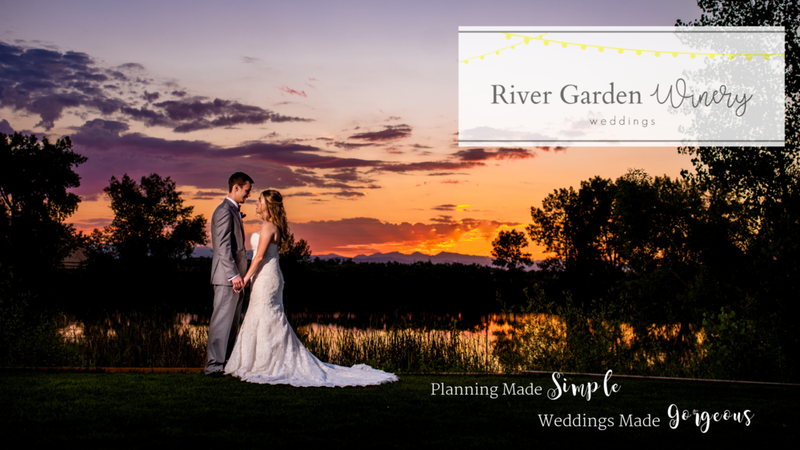 Our goal at River Garden is to give you a wonderful wedding, while keeping the planning fun and stress free! We want all of our couples to feel at home and have a sense of ease during the whole wedding planning process! We can do this with our All-Inclusive Wedding Packages! What you will find at River Garden is your very own wedding sanctuary. It's truly a hidden gem with 45 acres perfectly situated on the high plains of Colorado. We are a one of a kind venue surrounded by natural beauty, mature trees, and panoramic views of the Rocky Mountains! And guess what- we are the region's only waterfront vineyard! Come out and visit us! Let's talk about your wedding while sipping on some delicious wine! We can't wait to hear from you! What does All-Inclusive Wedding Packages mean? This means we have partnered up with eight wonderful vendors to make your dream wedding come true! Everyone loves pictures! Here are some of our favorites— all outlined by months so you can see the seasons at River Garden! What about this- what about that? Here are some of the most popular questions and answers we are often asked. We are so glad you are interested in River Garden Winery! Our wedding planner will be in contact with you soon. In the mean time- here is a link to download our wedding packages!